The 2018 Gold Glove announcement continued an individual defensive dynasty, provided a surprise tie and revealed a major upset for the Atlanta Braves. The organization captured three Gold Gloves with outfielders Ender Inciarte and Nick Markakis and first baseman Freddie Freeman, the highest single-season total in franchise history since the award’s inception in 1957. Inciarte, the team’s 28-year-old defensive star in center field, was the surprise-free selection as he earned his third consecutive Gold Glove after leading all outfielders in outs above average per Statcast. (He leads all outfielders in that category since joining the Braves in 2016.) The only other outfielders in franchise history to capture at least three straight Gold Gloves: Hank Aaron, Dale Murphy and Andruw Jones. 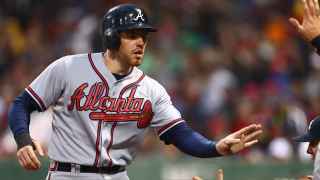 Freddie Freeman ended his career-long Gold Glove drought in strange fashion, tying with Chicago Cubs star Anthony Rizzo in the vote. Freeman led all National League first basemen in defensive runs saved and logged 24 scoops on the season. He’s the organization’s first Gold Glove first baseman and just the third Braves corner infielder to capture the award. Nick Markakis’ third career Gold Glove trophy was one of the night’s biggest upsets, edging Diamondbacks Jon Jay and, more specifically, ex-Brave and longtime defensive standout Jason Heyward. It is the veteran right fielder’s first Gold Glove win since 2014 and the hardware gives the Braves two Gold Glove outfielders in the same season for the first time since Andruw Jones and Jeff Francoeur in 2007. Pitcher Julio Teheran and left fielder Adam Duvall also made the NL finalist cut but lost to Arizona’s Zack Greinke and Pittsburgh’s Corey Dickerson, respectively.